To change the logo in this template, simply replace this link http://i33.tinypic.com/xf4xnn.png with the URL of your own logo. How to remove ad slots below navigation bar? How to insert google ads in the header ? and replace it with the code of your ads. .-= Dan*´s last blog ..The Impossible Coin Vanish =-. Completely agree with you mate. It is neat and it seems effective to the eyes. Thanks for the share. .-= NpXp´s last blog ..Favicon For Your WordPress Blog â€“ Top 3 Free Sources =-. .-= Anish KS´s last blog ..â€˜DHOOM 2â€² On Sunday 1 Nov At 8:00 PM on Sony Entertainment Television =-. .-= Shafar´s last blog ..Block Ads and Banners in Firefox using Adblock Plus =-. Thanks Simran. Clean and Elegant. .-= Amal Roy´s last blog ..How To RUN / Get XP in Windows 7 – Best Alternative to XP Mode in 7 =-. .-= Rahul´s last blog ..New Yahoo Search â€“ Did You Noticed =-. nice theme and lots of option i like it. btw send me your orkut id ll send you the invitation..
.-= Rajesh Kanuri´s last blog ..Get Orkut New Design Invitations By Subscribing Feeds =-. looking cool… beneficiary to monetize. nice theme, do you have the other for wordpress? Nice template it’s really great. .-= Sudeep Acharya´s last blog ..How to fix error You do not have the proper privilege level to change the System time =-. I want to replace the search box with adsense search box in this template. How can I do this? and with your adsense search box code. How can I replace Navads with adsense ads? .-= haru´s last blog ..20 Most Wanted Blogspot Templates =-. How do you move the post footer from below the post title to below the post body? I didn’t understand what you exactly want to ask ? Sorry to bug with more questions. Is there a way to make the main sidebar different color than the left and right sidebar? Also, how can I make sure the sidebars stretch all the way down to the footer/credit or as tall as the main body? Thanks. Hi i would like to change the navbar id with click able images , how can out link so the image can be click. thanks. Not a bad theme at all. I have been saying I need to start making my own WordPress theme because I know I have what it takes and can do it. I’m just so busy lately that my time for blogging is almost zero. You have somewhat given me the push I think I need. great theme, definely a professional template . .
Nice colors and good design. 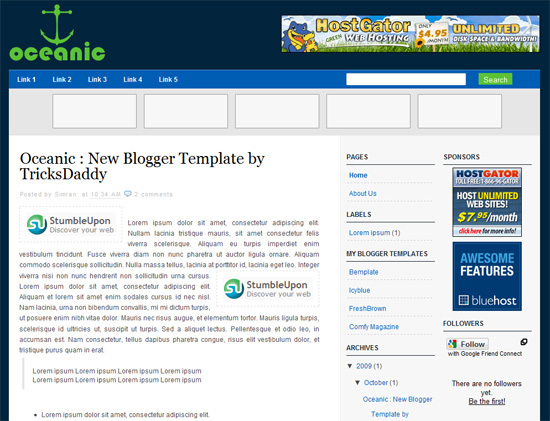 Great blogger template.